PARK SLOPE — Forget the fancy stroller. The baby-carrying harness is the accessory du jour. Many new parents tackling the city’s subway stairs, busy sidewalks and narrow store aisles sans stroller are now looking beyond the well-known Baby Bjorn carrier. But for those who don't know about a front wrap cross-carry or how to knot a mei tai, there’s a cottage industry springing up around the art of babywearing. “It’s like trying on a pair of shoes,” said Adriane Stare, founder of Greenpoint’s Caribou Baby boutique, which started offering a free babywearing class (Fridays and Saturdays) in February and launched a series of YouTube videos on how to wear babies in March. That, however, isn’t always possible, said Stare, who launched the class because her shop was swamped when staff were doing one-on-one demos, which often lasted anywhere from 30 minutes to two hours. “Wearing your baby is so much easier than schlepping up the subway or bus with a stroller,” said Karen Paperno of Park Slope’s Boing Boing, where she resumed weekly babywearing classes ($20, Saturdays) in January after a two-year hiatus. 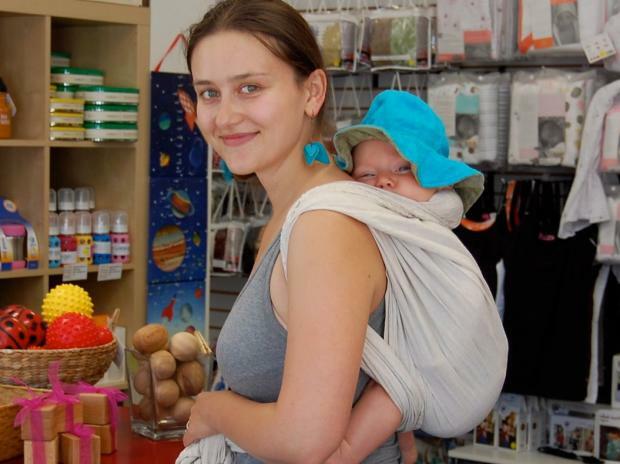 Babywearing experts are eager to make sure parents are safely carrying their tots. They want to prevent people from potentially dangerous mistakes, like emulating the way Kourtney Kardashian was wearing her baby low down in a sling while cooking near a hot stove, in recent picture her sister Kim posted. Despite the growing popularity of wraps, slings and other carriers, “it’s still niche business,” noted Fehn, who closed her store on the Upper East Side in February after six years. She’s now focusing on Internet sales, and is traveling to baby and nursing stores, such as the Upper Breast Side on the Upper West Side, where she offers a babywearing drop-in clinic ($15, Tuesdays). She also offers private consultations in people's homes, or "Babywearing 101" classes. Park Slope mom and middle school principal Jessica Simmons began wearing her 3-month-old Sam as a way to help him to feel more secure, as espoused by attachment parenting, and to help herself get things done in and out of the house, she said. After trying on four carriers at Caribou Baby she “fell in love” with a Girasol woven cloth wrap that she and her husband both wear. “I mostly enjoy snuggling him close and the ease with which I can accomplish tasks and walk with him for a while in it,” she said, noting that she done everything from laundry to using the bathroom while wearing him. The Baby Bjorn is the most popular of the soft pack carriers, but many babywearing experts frown on it. These moms often come back when their babies are 6 months old and ask for an ErgoBaby, which has back and hip support, but only lets the baby face inward. For the past year or so, LuLu’s has been selling the Beco — which has the support of an Ergo, but the outward facing option like the Bjorn — like hotcakes. A ring sling — a long piece of fabric with that can be adjusted by ring that’s easy to take on and off — was what Boing Boing’s Paperno used with her two kids. The sling goes over one shoulder like a messenger bag. Stare said parents like ring slings for kids who are walking and crawling, since it’s so easy to pick them up and put them in or take them out. Plus, they’re lightweight, which helps in the warm weather. “It feels simpler to people. You’re not tying any knots,” Stare said. “People love it for around the house for a newborn and you can nurse in it. But it can be a fiddly carrier for a lot of people. You have to really know how to use it to get good support. A lot of people come back to us for adjustments." Wraps are long pieces of fabric that can be tied in several different ways around babies. At Boing Boing, the Moby, which is made of a stretchy jersey material, is a best seller, Paperno said. But Caribou Baby doesn’t stock the Moby, preferring spandex material for its stretchy carriers. But woven wraps tend to be more popular. And they can be worn until kids are past the age of 2, she added. This Asian-style carrier is essentially a panel of fabric with four straps — two that tie around your waist and two that go around your shoulders. “It’s similar to a woven carrier, but easier,” Stare said. “It can be cooler [temperature-wise] for little babies and less intimidating to put on, but some people can’t stand straps." A pouch sling is essentially a big pocket that a baby “sits” in and is worn on one shoulder like a ring sling, but it usually isn’t adjustable. Because of possible dangers of babies being worn incorrectly in pouches and the possibility of airways blocked if their chins are squished up to their chests, many babywearing experts don’t recommend these.